Two hikers make their way up the Chain Lakes Trail to the Heather Meadows parking lot in the Bagley Lakes/Heather Meadows area of Washington State, USA. 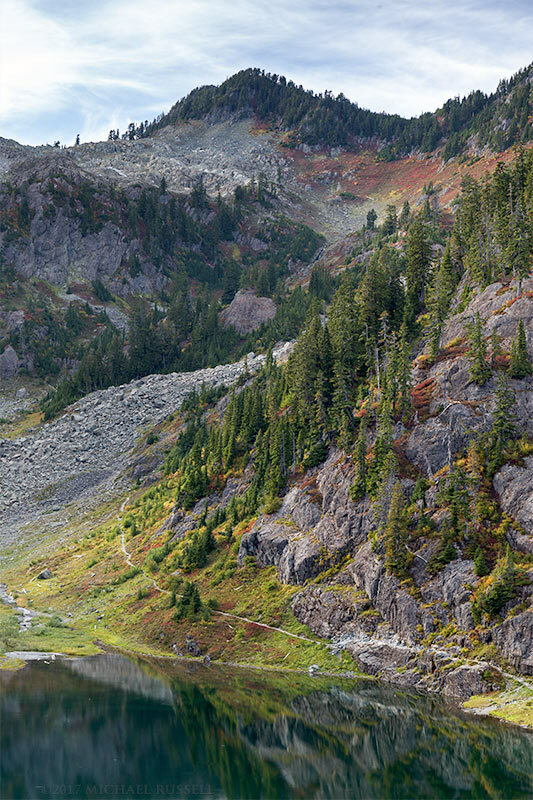 The first photograph above shows two hikers heading up to the parking lot on the Chain Lakes Trail. The section of the Chain Lakes Trail by Bagley Lakes is one of the trails I frequent with many great views of the lakes and surrounding mountains. One of the difficulties of completing the Chain Lakes Trail in its entirety is where to park your vehicle. If you part at Artist Point, when you get the the area photographed here you still have a 250 meter (820 feet) elevation climb to the parking lot. If you park here at Heather Meadows, you start with that climb. Wishing to avoid that, many park at Artist Point but ask for a ride from those visiting the lower parking lot. I gave the first gentleman in this photograph a ride to his truck so he could drive back down and pick up his hiking companion at Heather Meadows. There was a small lineup of families and individual hikers wanting the same. I’m sure some were out of luck and had to make the climb back to the car. 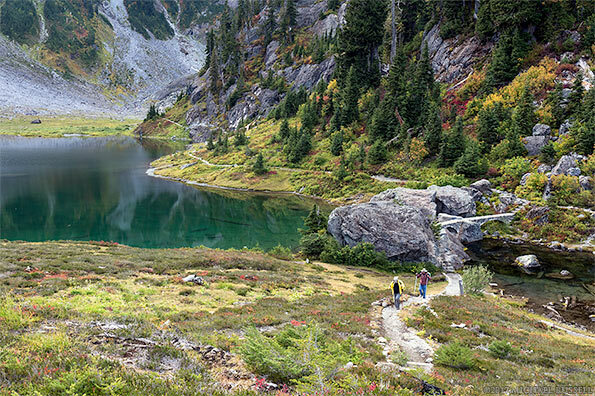 The second photo was made from the Fire and Ice Trail which has a nice lookout over Bagley Lakes. This was the spot I made one of my favourite panorama photographs and this time made a few photographs of the colour in the water, fall foliage on the side of Mount Herman, and the peak near Herman Saddle. I’ve made the hike to the saddle before, and hope to do it again in the coming years when I have time. The view from up there is pretty awesome! 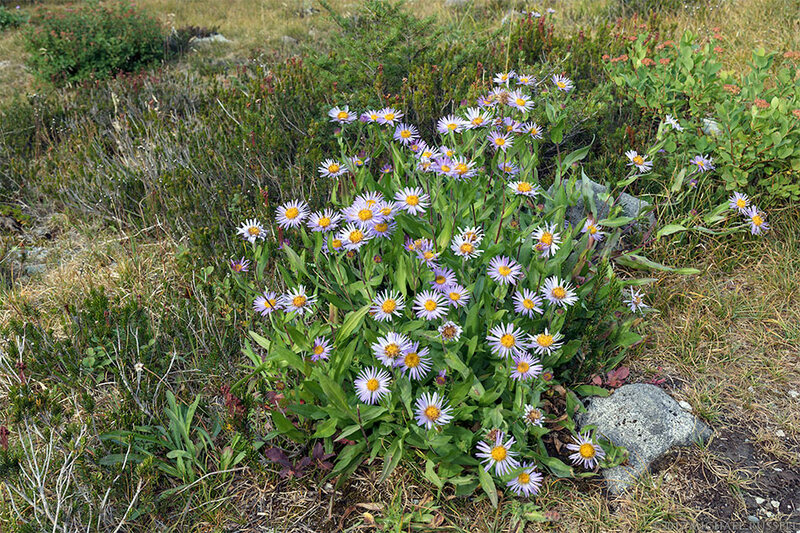 One of the things I was not expecting along the various trails were some late blooming Subalpine Aster (Eurybia merita) flowers. This was fairly late in the fall season (at this elevation) and I had figured that any wildflowers would have been long gone. Perhaps this spot had much more snow to melt during the summer and consequently the flowers here were a bit behind the others in the area. I had planned on heading back to Artist Point and Heather Meadows the next week. Seasons change quickly in the mountains and this area had so much snow just a few days after my visit they closed to road to Artist point. I’m lucky I made it up there when I did, but I guess other opportunities for hiking there will have to wait until next July/August at the earliest. 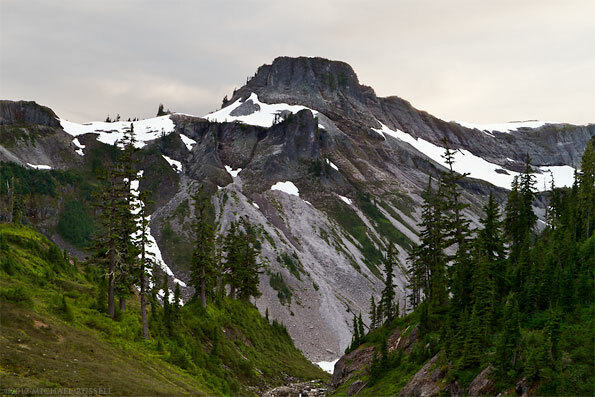 For more of my photography from Heather Meadows visit my Mount Baker-Snoqualmie National Forest Gallery. Table Mountain from the Bagley Lakes Trail at the Mount Baker-Snoqualmie National Forest in Washington State, USA. This is a photo I made in late September of Table Mountain in the Mount Baker Wilderness. This was along the Bagley Lakes Trail – and was one of the first short hikes I’d done in the area other than walking along the ridge near Artist Point. Being late September I was expecting that there would be few (if any) wildflowers and the Fall colours would be well on their way to starting in the various Vaccinium bushes etc. Everything was still green and the wildflowers were either just past, or still going strong (as was the case for the Lupines). I went hiking there 2 weeks later – and there STILL were hardly any leaves turning. I am curious to see what this year brings for Summer and Fall weather.